The use of the Web Prelog is limited to official use only and the link is no longer available online. If you need access to the prelog system please contact Sue Tecce at 914-231-4410. The Division of Forensic Sciences does not accept syringes as evidence. Please do not prelog or attempt to submit syringes. Note: The Division of Forensic Sciences prepares an annual report with statistics regarding submissions from all law enforcement agencies. It is available here. To avoid delays in service at our evidence window, review our ”Peak Evidence Submission Times” table. 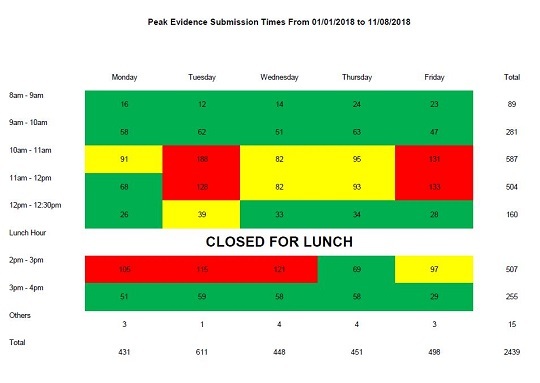 The times in red reflect our busiest hours, yellow, less busy times and green our least busy times. The table will be updated each month to reflect the most recent activity. Printed copies will be available at our evidence window.